Winemaker’s Notes: Our True Grit Chardonnay beckons with summer fruit and spicy wood smoke aromas rounded out with companionable tastes of rich pear, lemon creme, and apple butter. My Review: Good ol’ Chardonnay. Always a tricky open in my house with my wife’s distaste for oaked Chardonnay (not entirely hard to understand given the bevy of over-oaked Chardonnay out there). 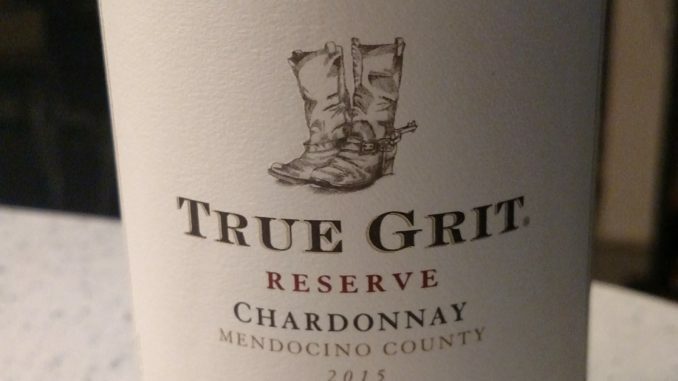 So how did the 2015 True Grit Reserve Chardonnay stand up? In the glass the wine was a light golden color and on the nose I picked up aromas of toasted almond. I went in knowing the wine had been oaked (93% New French Oak, 7% Stainless Steel), but I was actually impressed that it wasn’t overly oaked in the mouth – it was fairly crisp in the mouth, though it did round out as the wine warmed after coming out of the fridge. In the mouth I picked up notes of lemon creme and apple with a lightly crisp start and a lightly rounded finish to the wine. My wife and I paired the wine with herb grilled chicken and the wine did a nice job of pairing – it’s definitely meant to be paired with fish, chicken, or pork that’s been covered in herbs or some type of butter sauce. For $13 I was expecting the wine to be like chewing on a piece of oak bark, and while those oak notes were certainly there, I didn’t get the heavy butter notes that I think are what really put my wife off of oaked Chardonnay (I totally agree with her on that). It’s certainly not my favorite Chardonnay, and it’s unlikely to show up on my house again given my wife’s preferred tastes, but if you think this would align with your preferences in Chardonnay, it’s a sub-$20 wine that doesn’t club you over the head with one note, and that’s not nothing.